May Park View Cleanup Scheduled for Saturday the 7th | Park View, D.C. This month’s Park View Cleanup will begin at Georgia and Otis. 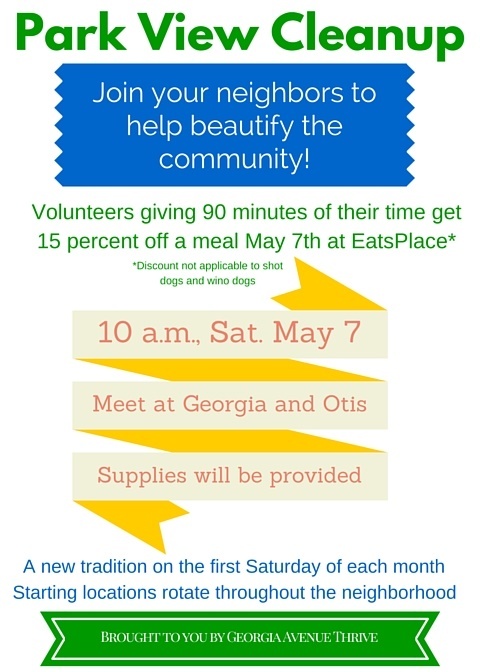 Another reason to participate is that EatsPlace is giving all volunteers 15 percent off meals on Saturday. See flyer below for details. This entry was posted on May 3, 2016 at 7:01 am and is filed under Community Involvement. You can subscribe via RSS 2.0 feed to this post's comments.